Lasers. They're the future of cinema, so you better get used to it. I've been attending CinemaCon (formerly ShoWest), the movie theater owners' convention, for the last 9 years and have seen many fantastic technical demos. One year James Cameron came and showed us his first look at High Frame Rates; one year Dolby introduced their (now everywhere) Atmos sound system with a custom install in a big auditorium where we get to see screenings. This year, Dolby held a demo of their latest offering - a system called Dolby Vision (we've written about it recently). It runs on two 4K laser projectors and they claimed that the contrast ratio they were getting up to is 1,000,000:1. Most cinemas today are barely 2,000:1. It was mesmerizing to see. There's a few details to clear up about what we are seeing. First things first, lasers (and "HDR") are not the same thing as "HFR" (or High Frame Rates, which James Cameron is all about and many moviegoers don't like). Secondly, this High Definition Range (or "HDR") branding is actually a brand new proprietary system from Dolby installed in the Christie 4K projectors. Instead of one DLP chip, there are multiple DLP chips, designed in a way to minimize light loss so that all of the good light goes straight to the screen. That means completely crisp, clear projection with unprecedented color depth. No really, you have never seen anything like 1,000,000:1 contrast ratio. The blacks looks completely black. It all looks spectacularly more luscious. Now here's the other thing about laser projection. Many are wondering: will I even notice a difference? The answer is, frankly, probably yes and no. If you're a diehard cinema enthusiast and visual purist like me, you will notice it immediately because there is so much more detail in the darker areas of each frame. However, not everyone may notice this at first. But the way to make them notice is giving a side-by-side comparison. At the beginning of our demo in CinemaCon, the screen comes up with some text saying something like "this is how it used to be", then the screen splits and the blacks really become black, the text fully stands out. That kind of side-by-side comparison will surely make your jaw drop, because of how much better it looks. I spoke with CJ Flynn of DCinemaTools.com while at CinemaCon about the Dolby system and what he knows about it. His discussion indicated that this new technology is so impressive, and Dolby is so heavily invested in perfecting the cinematic experience (including their Atmos sound), that it could cause other premium theatrical offerings to suffer when consumers start to realize just how spectacular this is. It's hard to believe that claim without actually seeing it yourself, but it sounds like (and from what I've seen here) this definitely is going to be the offering that cinema purists will always want to choose from now on. Except that even by next year, 2016, only 9 theaters in the US will have this installed. It's going to be a long roll out. 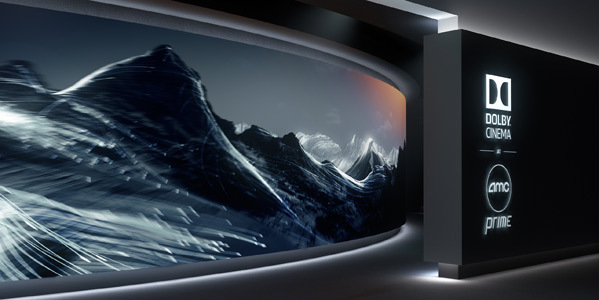 The "Dolby Cinema" branding, which is what that image above shows, refers to perfecting the theatrical experience so that light loss/reflection/noise and other potential technical drawbacks are minimal. The entire theater, from floor to seats to screen, is constructed and designed in a way so that the audio/visual experience is truly perfect. That's where you'll actually see a contrast of 1,000,000:1, because even exit signs and aisle lighting used in most theaters today add too much ambient light that detracts from the amount of depth we see on screen. This is the ideal "premium" offering that many movie lovers have been waiting for. While I have been discussing the future of cinema for many years, after this year's CinemaCon presentation I've got a really good feeling about the direction Dolby is going with this premium "Dolby Cinema" setup. AMC is already a believer too, as they've committed to a long term partnership with Dolby as well. I can talk about it and write about it all day long, but you have to experience this yourself, see the differences between standard projection and Dolby's HDR laser, to truly feel as excited for this future as I do. It will be worth it. Especially if you love the extraordinary glory of the big screen. For more information, check out Dolby.com. Awesome. Will they be charging a "visual premium" for these films (in these special built theaters) the way they do for the darkened 3D movies? I'm all for improvements to the theater experience. But movie prices are so steep and only get more expensive, that I pick and choose a few movies a year to go see, especially when I take my kids. Avengers 2 will be an event in my household, since ticket prices and concessions for the film will put me well over the $60 range. Of course this is all moot for me, as I live in an area where the theater owners are small enough that they will never foot the bill to do this anyway. "Frickin' LASERS!" // One million to one! That is as good as OLED televisions! Insane! They've started to expand their brand in many many different ways. They are now "Sound Technology, Display Technology, Voice Technology" - http://www.dolby.com. It's the only way companies like this can continue to grow, by expanding their product lines in an increasingly competitive marketplace. This is an upgrade I can get behind. Can we focus a little less on 3D this round though? I'd be perfectly happy with one late night / early morning 2D showing in the premium theater. This is very exciting. Hoping NYC will have one of these by 2016. Sorry, its actually about 20,000:1 which sounds about right considering the patented implementation. But really, at this early stage, the exact number my still fluctuate as the final design of the projector may still be going through some small refinements/changes.. (Remember, typical digital cinema is about 1400:1, the new Barco and Christie Lasters are about 2700:1 HDR has no real definition in standards yet so its a little academic calling anything HDR.. but in general, 8000, or preferably 10000:1 is needed to be considered HDR by some experts in this area.